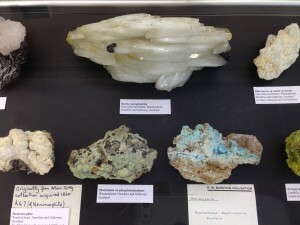 The Russell Society had a presence at the recent Yorkshire Mineral and Fossil Fair in Leyburn to promte our activities and encourage new members to join. 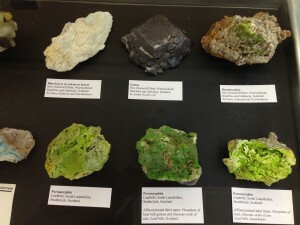 Our General Secretary Steve Warren organised the Society’s table, putting on a display of minerals from Leadhills and Wanlockhead (see a selection below). This created a good talking point and visitors were keen to see the minerals from these areas and hear about the Society. Perhaps other members would like to put on a display of British Isles specimens at forthcoming shows? The Lucky Dip, a box with specimens hidden in aggregate so youngsters had to dig for them, was also very popular. They loved rooting around and seemed really pleased with what they got. Any spare specimens members have, suitable for the lucky dip, are always welcome. Please include a label, mentioning The Russell Society, the site and the species where possible. For your diary, next year’s fair will be on 18th and 19th May, with further information from Don Edwards 01433-620304 or don.edwards@talktalk.net. The next Russell Society Annual Society Meeting is being organised by the Central Branch and will take place from Friday 6th to Sunday 8th April 2018. The location of the ASM will be College Court Conference Centre Hotel, Knighton Road, Leicester, LE2 3UF. Further details and a booking form will be circulated to members with JRS 20 towards the end of 2017.